Click here for more information about defining titles. The titles for both lists in the Multiple selection element can be defined here. A constant can be used here as well. If this option is activated, the multiple selection will be a mandatory field. If values from a multiple selection can be written to a data field, it is possible, e.g. through the export or import of an application, that the values are no longer valid. If "Display stored values" is selected, these invalid stored values will be displayed instead of the current configured display values. If this option is selected, invalid values will be deleted from data fields in the current data record. 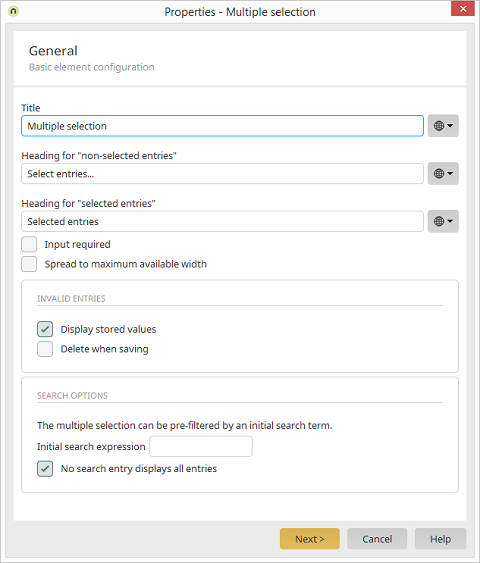 This search expression will be automatically entered in the search field and will filter the "Available" list when the corresponding page is loaded. The maximum number of entries will be shown, if the character * is entered in the search field. When this setting is activated, all results will be shown if the search field is empty.